JOHN BUSHEE ; A MODEL FOR OTHERS!! JOHN BUSHEE > A MODEL FOR OTHERS!! 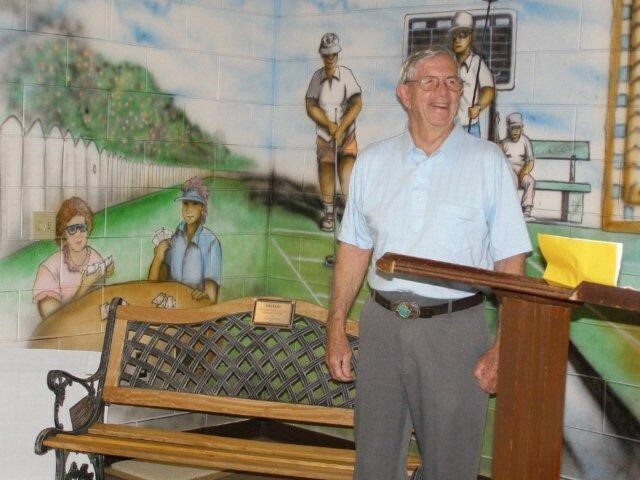 John’s home Club, Sebring, held an Appreciation Day for John Bushee on Wednesday, March 24th, 2010. One Hundred and Twenty-Six fellow shufflers turned out to show their respect for John. Chappie followed with an itemized list of the tasks performed regularly by John. I do not exaggerate when I tell you that to repeat the list here would take an excessive amount of space!!! Not only has John performed the traditional items associated with court maintenance, he has a penchant for saving money for the Club; ensuring sound environmental practices are followed; giving freely of his building skills; and even providing advice on computers!!! I could go on, but you begin to have an appreciation as to the reason 126 friends showed up. Following Chappie’s remarks, audience members were invited to the mike to “do their thing”. Some followed the “roast theme”; some gave traditional thanks. The significance was the sheer numbers who took the mike and demonstrated their respect to John!! People came from across the Central District. CD President David Earle and wife Glenna, from Zephyrhills; Gibb & Jerry Stannard from Winter Haven; Jim and Marlene Corbeil, Winter Haven; Sue Krynak & Clair Kitson, Sanlan Ranch; Sue Masters, Barb Fournier & Wilson Weed, St Cloud; Max & Ruth Tate, Pioneer Creek; Larry Brown, Pioneer Creek; Lou Faulkner, Pioneer Creek; Nancy Singleton, Pioneer Creek; Mel & Gert Elgersma, Lakeland; Stan & Lois McCormack, Lakeland and finally the many members of Avon Park and Sebring. I can think of no other person who would command such respect for that which he has contributed to our sport. Thank You John!! Stan and Alf of The Shuffler. 2010 03 25.